This African-American artist and educator is best known for his murals in Houston. Maya Angelou described Biggers work as historic that "…leads us through his expressions into the discovery of ourselves at our most intimate level." With a bent back and powerful hands, an African American man figures prominently in a large mural in Houston’s Blue Triangle YWCA. 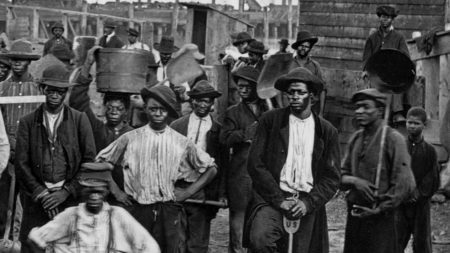 To his left, Harriet Tubman leads weary slaves to freedom. To his right, Sojourner Truth stands while children march proudly into a schoolhouse. Biggers achieved recognition as an artist for his drawings and sculptures, but he is best known for his murals. These murals form a rich part of Houston’s visual and public landscape at Texas Southern University, the University of Houston, Tom Bass Park, and Christina V. Adair Park. In 1949, Biggers was named chairman of the art department at the institution that would become Texas Southern University. Over the next thirty-four years Biggers trained the next generation of African American artists and teachers that form a vital part of Biggers’ legacy. Barr, Alwyn and Robert A. Calvert, eds. Black Leaders: Texans for Their Times. Denton: Texas State Historical Association, 1990. Biggers, John Thomas. Ananse: The Web of Life in Africa. Austin: University of Texas Press, 1996. Biggers, John Thomas and Carroll Simms. Black Art in Houston: The Texas Southern University Experience. College Station: Texas A&M University Press, 1978. Biggers, John Thomas, John Mason Brewer, and Alvia J. Wardlaw. Aunt Dicy Tales: John Biggers’ Drawings for the Folktale. Austin: Ransom Center, 1999. Published in conjunction with the exhibition “Aunt Dicy Tales: John Biggers’ Drawings for the Folktale” shown at the Harry Ransom Center. John Biggers: My America: The 1940s and 1950s – Paintings, Sculpture and Drawings. Foreword by Whitfield Lovell. New York: Michael Rosenfeld Gallery. Published in conjunction with the exhibition “John Biggers: My America” shown at the Michael Rosenfeld Gallery. Theisen, Olive Jensen. Walls That Speak: The Murals of John Thomas Biggers. Denton: University of North Texas Press, 2010. —–A Life on Paper: The Drawings and Lithographs of John Thomas Biggers. Denton: University of North Texas Press, 2006. Wardlaw, Alvia J. The Art of John Biggers: View from the Upper Room. New York: Harry N. Abrams, 1995. This episode first aired on February 18, 2012. 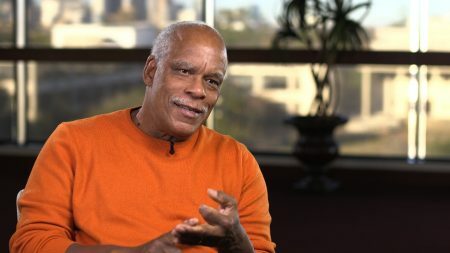 Video: What Inspired Stanley Nelson To Make The Documentary “Tell Them We Are Rising”?